Lady Louisas influence at Castletown can be seen not only inside the house but also in the carefully laid out parkland that surrounds the house. Castletown in the eighteenth century did not have formal flower gardens. Instead formally laid out landscapes in the French Baroque style were popular during this period. Alterations to the landscape at Castletown began during Katherine Conollys stewardship of the estate, under the influence of Lady Anne Conolly, who was influenced by her fathers work at Wentworth Castle in Yorkshire. Vistas connecting the house to the Wonderful Barn and the Folly were created, while early demesne maps also show a pond at the rear of the house and clearly marked meandering pathways through the woodland behind. But it was only with the arrival of Lady Louisa in 1759 that the Castletown landscape began to be radically altered in line with contemporary fashion. Influenced by the improvements made by her sister Emily, Duchess of Leinster at Carton, Louisa turned to the Castletown parkland. The river Liffey to the south of the house became the focal point of the demesne. A walk was created along the banks of the river, while rapids were created in the river to add to the picturesque quality. A number of garden buildings were also constructed. These included a classical style temple complete with columns removed from the Long Gallery during its redecoration in the 1760s. This temple, visible from the from the south front of the house, was erected in honour of Sarah Siddons, the actress. Further along the river a Bathing House, now in ruins, was built to designs drawn up by Louisa herself, although how much bathing actually took place is unknown. The eighteenth century Castletown landscape has survived remarkably well. 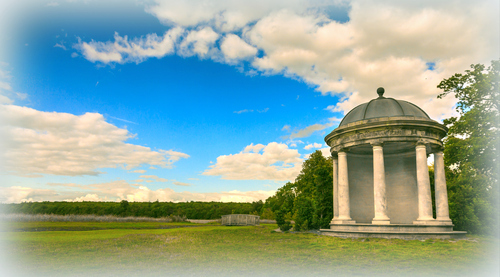 It is still possible to wander along Lady Louisas river walks and see her Temple and the remains of the Bathing House. In the nineteenth century, efforts were concentrated on the immediate environs of the house, with the creation of a formal garden behind the house, and the planting of the yew trees in front of the house. The break up of the estate in the 1960s, however meant that the immense walled gardens, formerly situated to the north-west of the house have been built upon. These kitchen gardens were by the early twentieth century the most profitable aspect of the estate, and a great source of local employment. Today only the farmyard beyond the West Wing remains.